A Short Cut To Train Your Body To Swing Perfectly? Have you experienced the frustration of trying to lock a swing change into muscle memory? You work on one thing and something else gets out of whack. So your focus switches from one swing thought to another meaning progress is slow at best. It discourages many golfers from even trying to improve their swing. Wouldn’t it be great if there was a short cut to training your body to memorize your best swing? A swing you’d be proud to take to any course. A swing you could count on to deliver even in the most pressure filled circumstances. Can Muscle Memory Improve Your Swing In Minutes? The world renowned Human Performance Laboratory has spent decades studying athletic performance and the secrets of training athletes to lock the correct motion into muscle memory − so they perform at their best when it counts. They found that under optimal training conditions athletes will develop muscle memory in a fraction of the time, allowing them to improve their performance quickly and easily. 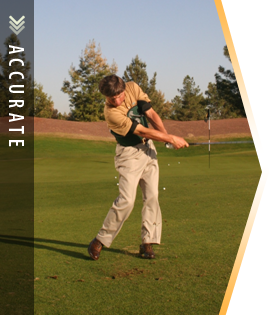 As you already know, the golf swing is so complex you can’t think your way through each swing. So golfers must rely on their muscle memory out on the course. The biggest challenge is memorizing the right swing, rather than repeating the same old mistakes and bad habits so they become ingrained in your muscle memory. Create the optimal learning conditions the Human Performance Laboratory identified for rapid muscle memory training. 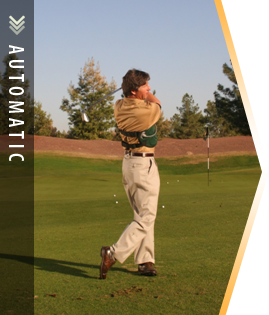 So now, instead of wasting time and money ‘trying’ to improve your swing, the Swing Jacket let’s you experience the perfect swing, shot after shot, and quickly lock that swing into muscle memory so you perform on the course. What are those optimal conditions? 1. Practice your optimal swing. The old expression “practice makes perfect” only works if you’re repeating a perfect swing. Do you sometimes feel practicing ‘your’ swing is not really making you a better player? 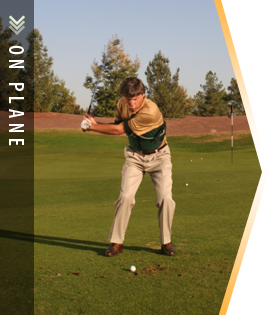 The Swing Jacket guides you through the optimal bio-mechanical on-plane swing. A swing that embodies the core fundamentals common to the world’s best ball strikers. Human Performance Laboratory studies found that when athletes focus on mechanics muscle memory is painfully slow to develop. No wonder it’s so tough to improve when your mind is occupied. The Swing Jacket does all the thinking for you. 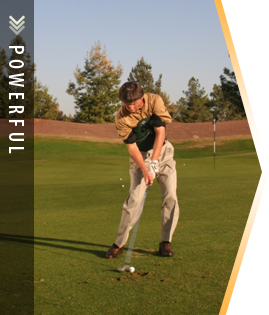 Free of swing thoughts you can now focus on the FEEL of your swing, confident you’re doing it right. To build muscle memory that will stand up out on the course you need to perform in game-like conditions — hitting full shots – using your clubs – focused on a target. There is nothing as effective as having the full sensory experience of hitting it long and straight, shot after shot, to build confidence. Jason’s game was stuck. Each of the highly rated pros he’d taken lessons from told him something completely different. In spite of many hours on the range he was frustrated by the lack of meaningful progress. Too many confusing and often contradictory swing thoughts spoiled the fun. Five minutes with the Swing Jacket cleared up the confusion and got his swing on track. Now that he could FEEL the correct motion and repeat it consistently his body responded. After hitting only ten shots with the Swing Jacket his body had already begun to memorize his powerful, accurate new on-plane swing. Your time and money are too precious to waste ‘trying’ to improve. The challenge with improving your swing through trial and error is that even if you improve your results it’s very difficult to repeat the new, improved motion consistently enough to lock it into muscle memory. If what you’ve done in the past has failed to deliver the results you’re REALLY looking for here’s an opportunity to try a completely different approach — a short cut that simplifies everything for you.